Could an outdated marketing department structure hold you back from success? It’s certainly possible. This industry moves fast. In order to keep up, you need the right people, with the right skills, doing the right tasks. If silos prevent your team from doing its best work, you could wind up spinning your wheels, without realizing why you’re not moving forward. Unfortunately, many organizations are unprepared to adapt to future changes. Leaders will staff talent skilled in emerging technologies and tactics, while followers with catch up too late (if at all). What skills will you need (and who has those skills)? How will you organize your team for maximum efficiency and success? What tools and software do you need to keep everyone in sync? This post will help answer those questions (and more). It’s easier to achieve success when you can visualize it. Using this template, you can map out your org chart easily to help you and your company see what a successful team structure should look like. This also helps everyone understand their coworkers’ roles and big-picture value. Managing marketing teams effectively requires the right tools. And there's no better choice than CoSchedule with Team Management Dashboard. Coordinate internal resources effectively to ensure the right team members are working on the right things. Balance workloads and resource allocation so your team can plan ahead without burning out. Plan project timelines and monitor progress so you can plan your work, work your plan, and measure productivity. Why Pay Attention to Team Structure? With so many competing priorities vying for your attention, what makes this so important? The answer is simple: well-organized teams are better positioned to succeed than ones that aren't. But, getting it right isn't easy. What if you have the right people on the wrong team? Or lack the right teams to support the right people? Or the right people can’t communicate because of a communication barrier between teams? ^^^ If any of the above scenarios is true for your organization, you’re shortchanging your success. Fortunately, correcting these issues can have an outsized impact on future success. Not only that, but getting on the track is within your reach. A good team structure can have an outsized impact on future success. What Do Common Marketing Team Structures Look Like? There’s no such thing as an ideal one-size-fits-all team structure. Different models may work better for different organizations and industries. The size of your company overall plays an impact, too. If you’ve spent much time searching for examples to follow, odds are you’ve felt overwhelmed, too. It’s not uncommon to hear advice suggesting you need a dozen roles for one team, and multiple teams spread across your entire marketing department. That might make sense for large enterprises with tons of resources. But, for the majority of companies, that may not be realistic. To simplify things, here are some theoretical examples for companies of different sizes. Small Business Marketing Team Structure: Lean and Scrappy. In a small business, odds are you’re hiring one or two people to tackle marketing. If you’re fortunate, you may have three or more. When available talent is this thin, how do you prioritize what these folks should be doing? Content Creation: Your marketer(s) will need to be able to update website content, write blog posts, and craft catchy copy for social media and email. Graphic Design: At a minimum, a working knowledge of Photoshop (or, failing that, free design apps like Canva) will be necessary. Technical Skills: A basic grasp of SEO is likely essential. A general ability to use a content management system (like WordPress) will be useful, too. Social Media Management: This can easily consume tons of time. (Scheduling tools can help). Project Management: How will you keep everything on track? This is just a handful of the different tasks they might be responsible for. What could this look like when its mapped out? Mid-Level Marketing Team Structure: Building for Growth. At this point, your marketing department may have multiple teams. 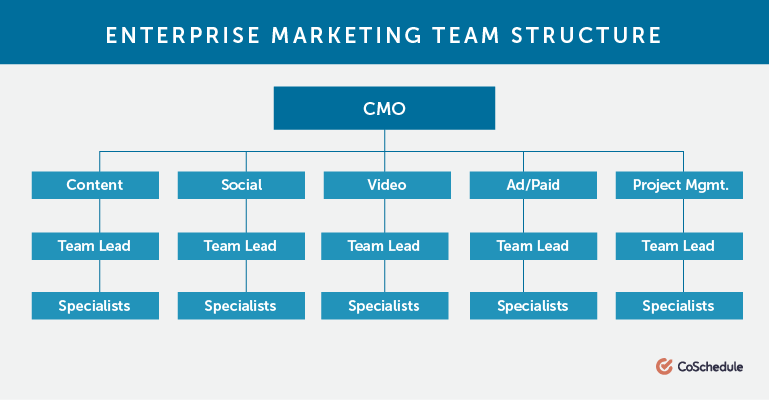 Enterprise Marketing Team Structure: Specialists With Deep Expertise. So far, this post has looked a few general examples. HubSpot did an excellent job breaking down seven common org structures (along with their respective pros and cons), getting a bit more granular into each one. This example is broken down across business functions. One can assume each spoke under Marketing leads down to more sub-teams (content, social, analytics, and so forth). It’s also interesting to note how marketing and sales operate side-by-side (after all, someone has to close deals on the leads marketing generates). How can you construct a functional marketing org chart? In this next example, the company is organized based on product-category departments. Each department could presumably have its own marketing team. This type of structure is common at large enterprises that make lots of different types of products. For example, consider a company like Samsung, which produces everything from phones to refrigerators. How can you construct a marketing team structure based on clear divisions? This example is similar to the previous one, except teams are split up based on customer-centric divisions instead of product-based ones. How can marketing teams be organized around specific marketing segments? For extremely large enterprises or companies with offices around the world, a geographic org chart like this one may make sense. A company with different geographic-based teams within a country might use something similar as well. Is your marketing org chart based on geography and location? Next up is a process-based structure, where teams are divided up based on where they fit in the production of a product, from ideation all the way through to customer service. In this example, however, it’s unclear exactly where marketing may fit (though content can certainly support all initiatives shown). How can marketing leaders develop process-based org charts? If this one reminds you of a certain early 2000s movie series, you’re not alone. This example illustrates a different kind of matrix though. It’s similar to some of the examples above, but instead of different divisions having their own marketing teams, the marketing, sales, and service functions all answer to one department head. From there, smaller sub-teams work with each division. It’s a subtle but important distinction. In a circular organizational structure, a marketing services department responds to work requests from other areas. Have you tried using a circular marketing org structure? Next, let’s look at what individual teams could look like when mapped out. You don’t need an enormous team to start content marketing. But, the work requires lots of different tactics and disciplines, and the more help you have, the better. What does your PR team org chart look like? Planning an inbound marketing team org chart? Read this first. Search engine optimization is interesting because it often spans several teams across an organization. BuiltVisible breaks down four different areas a single SEO team needs to cover: technical SEO, content, outreach and off-site SEO (links), and analytics. How should SEO teams be structured? The technical aspects may require assistance from a development team. Content might be created by a content team or a separate marketing department (although SEO should be aligned with marketing). A PR team or specialist might help with link acquisition and other off-site strategies (even if the terms a link builder and a PR pro use may differ according to their goals). Analysts often measure all aspects of a company’s marketing efforts. So, while this may look like a simple diagram, but there’s more than meets the eye. What’s the Problem With Following Someone Else’s Org Chart? It’s easier to know what to do, when you have a good example to follow. But, when it comes to organizing your marketing department, you have to do what makes the most sense for your company. That may or may not entail following a template down to a T.
Collectively, the examples above illustrate one overarching point: there are a lot of different types of companies and organizations out there. Different sizes. Different industries. Different teams spread across different departments. How can one-size-fit-all recommendations work for your business? At best, they may offer either a starting point, or something to compare yourself against. If your current team structure doesn’t work, and it also looks nothing like what’s considered standard, you know where to start diagnosing issues. But, what will always work best, is figuring out what your specific organization needs to succeed. How Did CoSchedule Grow Its Marketing Teams? When CoSchedule first started, Nathan Ellering (now Head of Demand Generation) was a one-person team. While CEO and co-founder Garrett Moon contributed content and guidance, all things marketing were owned by a single staffer. Talk about a high-pressure environment. The upside? Nathan had total creative control and free reign to test what worked (and what didn’t). He’d learn a new tactic or get started with a new channel. Then, once he figured it out, another team member would be brought on board to take it over. Eventually, more teams were added to tackle new tasks, each strategically selected to support business growth for a fast-moving startup. The best marketing team layout is the one you build yourself. A structure that’s tailored to your own needs is going to work better than rigidly sticking to the way things have always been done, or filling roles you think you need because they’re what everyone else is doing. Before thinking about specific roles, think about the work that needs to be completed. This doesn’t necessarily mean figuring out what’s the next hot marketing trend and hiring to fill that gap. It means figuring out what makes the most sense for your business, and finding talent to fit your own needs. That’s what the CoSchedule team did when it started out. The results speak for themselves, and might not have been attained as easily had the company followed a traditional hiring pattern. Create content answering those queries. Promote it via social media and email. That’s effective for bringing in an audience, and eventually converting that audience into a paid customer base. It then added product marketers to help sell the product once an audience had been built. Next, a PR team was built out to help manage key relationships, 10X the buzz around the product, and more. Your competition got where they are somehow. Copying them isn’t necessarily a recipe for duplicating success. But, studying them might give you ideas on which roles you need to hire for. This can help you sketch out a loose idea of how a marketing department like yours might be structured. You might also reveal roles or opportunities you hadn’t considered before. CoSchedule focuses on 10X marketing. This means prioritizing projects that deliver 10X improvements, rather than 10% improvements. It’s allowed the company to grow immensely, and guides how decisions get made. This process is geared toward content marketing, but you can adapt the core concept to prioritizing marketing roles and activities across the board. The goal: figure out the channels, tactics, and strategies that will contribute to 10X business growth. Broadly speaking, which roles will own which tactics and channels? Some channels might touch multiple teams (for example, customer service, PR, and content might all use social media for different purposes). You know what needs to be done. Now, who will own which tasks? Execute post based on outline. Ideation and writing execution might fall onto content marketing. Keyword research might too, if the organization doesn’t have a dedicated SEO specialist. A graphic designer would be best for creating stunning visual content. An editor or manager would need to review and schedule content. If a team has a dedicated analyst or analytics team, they’d own measuring performance and extracting actionable insights from data. Beyond knowing what you need done, understand what it will take to complete the work effectively. Then, hire accordingly, and divide tasks between the team members best suited to handle each one. Do This With CoSchedule: Task Templates are reusable checklists you can build directly into your marketing management platform with CoSchedule. See how they work. Sports teams sometimes draft talent using what’s called a “best available player” approach. This means that regardless of current talent gaps on their roster, they’ll take the best overall players they can find. Then, they’ll strategize on how to make the best use of those players. It’s all about doubling down on strengths, and finding ways to mitigate weaknesses (if they can’t be eliminated completely). Businesses often do something similar, where they’ll make room for talented team members, even if they weren’t initially hiring for their role. Networking Events: Are there any relevant professional groups or marketing meetups in your area? Conferences: Large marketing conferences like Inbound and Content Marketing World may be great places to find talent. Social Media: Reach out to your network for referrals. Someone you know might pass along your next great hire. Be sure to post about job opportunities on LinkedIn, or even consider doing some cold outreach to promising prospects you find. As you add staff and roles, you may find different people fit better on different teams. Now, here’s the kicker: your org chart might not look exactly like anyone else’s. You’re not your competition. In fact, you’re not anyone but yourselves. So, why be beholden to copying a rigid structure, when you could custom tailor your own talent to your own needs? Take this as permission to put people where they’re best suited to succeed, not where a chart says they have to be. The more your business grows, the more complex your needs may become. If you start small with a generalist marketing team, you may find certain areas or tasks drive particularly strong results. Or, you might not be able to execute certain tactics, without specialized help. Add another hire with the skills you need. They might be rolled into your marketing team, or act as a team of one until additional hires are brought on board. Build another team in your department to focus on a particular area. For example, you might add dedicated analytics, or even a marketing project management team. Hire an agency: Sometimes, it’s best to partner with an agency for external expertise. This guide from TeamWork provides insight into when to go in-house vs. hiring outside help. Teams of all sizes need the right tools to manage workflows effectively. Ideally, you’ll have a single platform that can consolidate tools, break down silos, and enable cross-functional team collaboration. Schedule and automate content. Powerful integrations with WordPress, major social networks, and email service providers make it possible to create and schedule content, all on one interactive marketing calendar. Manage team communication. Use Discussion Threads to keep communication organized. No more missed communication. Measure team productivity. With Team Performance Reports, you can quantify your marketing team’s true productivity. In short, CoSchedule is mission control for your entire marketing department. More than a simple content scheduling tool, it’s an entire platform for managing marketing teams and workflows. It’s the first place people go to plan, collaborate, and execute projects and campaigns. How is Your Marketing Department Structured? Hopefully, you’ve gained valuable insight into how marketing teams are organized. How does your own department compare, and how do you think it might change in the future? Leave a comment below and help start the conversation.